I wasn’t going to post these muffins until next week, but after tasting one, my friend Heather called me and insisted that I post these today, so here they are. I am in LoVe with these muffins, and I am pretty sure you will be too. They are probably the best muffins I have ever had, seriously they are. They are better than anything you could buy at a bakery. I finally made myself stop after eating three of these babies . . . I honestly could have eaten all 12 of them. Let me try and describe what you’ve got going on with these beauties . 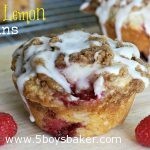 . . a sweet muffin with a hint of cinnamon, the sweetness of raspberries and hint of lemon, followed by a sweet cinnamony topping and then a sweet/tangy glaze drizzled on top . . .mmm, I think I might have to go eat another one. Trust me when I tell you that you need to make these . . .I think one is calling my name right now. Preheat oven to 350 degrees. Combine 1 1/2 cup flour, sugar, baking powder, salt, and 1/2 tsp cinnamon in a medium bowl. Make a well in the center of the dry ingredients and add the egg, melted butter, and buttermilk. Stir just until all ingredients are combined. Gently stir in the raspberries and 1 tsp lemon peel. Fill 12 paper-lined or greased muffin cups 3/4 full. Set aside. Combine, brown sugar, 1/4 flour, 1 tsp cinnamon and 1 tsp lemon peel. Cut in butter with pastry blender or fork or use your fingers until crumbly. Sprinkle mixture over muffins. Bake 20-25 minutes or until lightly golden brown. Cool for 20 minutes and glaze with mixture of powdered sugar and lemon juice. I have made these with both frozen and fresh raspberries and I think they turned out much better using fresh. The frozen berries all kind of sunk to the bottom and were a little messy, so I would highly recommend using fresh. By far, one of the best muffins I have ever tasted!!! These muffins are fabulous! Thanks for sharing!